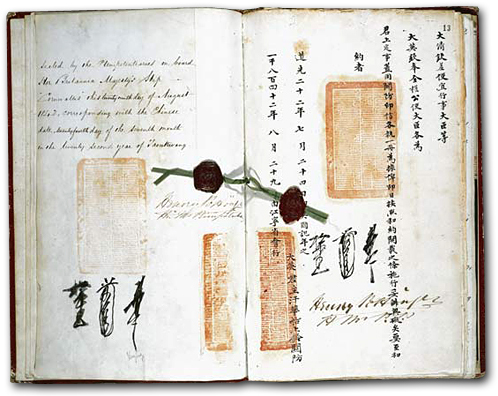 Under the Treaty of Nanking, signed on August 29, 1842, China agreed to open the five ports requested (Canton, Amoy, Foochow, Ningpo, and Shanghai), pay an indemnity of 20 million silver dollars, abolish the Cohong monopoly that hitherto had controlled trade in and through Canton, and adhere to a fixed schedule of customs duties. Additionally, the British were granted the right to occupy Hong Kong in perpetuity; this was their sole outright territorial acquisition. 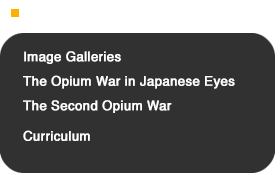 first Opium War, the Chinese were forced to pay a huge indemnity of 20 million silver dollars to the victors. 12 million of this sum was for covering British war costs; three million was for covering debts to English merchants; and five million was compensation for the opium stocks Commissioner Lin had destroyed in 1839. 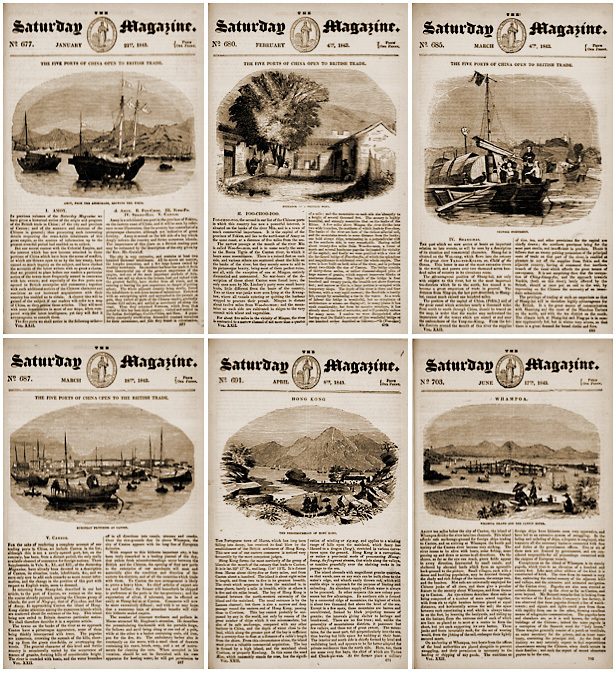 In 1843, the London publication Saturday Magazine ran a series of feature articles on the treaty ports opened under the Treaty of Nanking, plus England’s one outright territorial acquisition: Hong Kong. From left to right, top to bottom, the graphics feature Amoy, Foochow, Shanghai, Hong Kong, Canton, and Whampoa (at Canton). The Ningpo treaty port is not shown. A fatal and most costly mistake was made by those who managed the war and the treaty, in retaining the wretched, pestiferous island of Hong Kong, and giving up the beautiful and salubrious island of Cimsan [Chusan].... Hong Kong... is an unproductive, mountainous, lumpish isle... separated from the mainland of China only by a very narrow strait.... This proximity allows the pirates and other plunderers of the main to cross over to the isle by night, and there commit their depredations and atrocities.... The mortality of our troops has been as one in three and a half. The diseases are endemic fevers, diarrhea, dysentery, and pulmonic complaints.... The population [of Canton] is perverse, presumptuous, turbulent, and altogether the most indocile and the worst people in China. From these unpromising beginnings, Hong Kong rose to become the dominant commercial city in China. 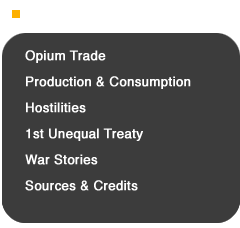 Despite such minor complaints, the first Opium War was widely regarded in England as a great triumph, both for the nation and for Western notions of commercial and technological progress more generally. A good sense of this is conveyed in the gold medal the government struck commemorating “The Triumph of the British Arms, 1842.” A profile of Queen Victoria, her hair decorated with roses and other flowers, graces the front of the medal. The reverse side is given to celebration. Here the detailed relief depicts four British officers, one holding the Royal Standard, facing four mandarin officials. 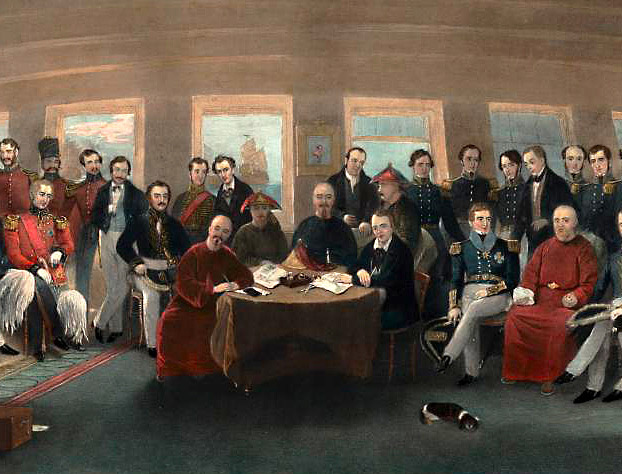 The two representatives in the center of the scene hold a scroll of the treaty between them. The figure of Peace looks down upon them while the angel of Victory flies above, blowing a trumpet. A pagoda stands behind the Chinese officials, symbolic of traditional China. Visible behind England’s military representatives is a ship with furled sails. In 1844, the United States and France rode on England’s triumph to negotiate their own treaties with the Qing government, effectively internationalizing and consolidating the basis of what became known as the “unequal treaty” system. These treaties, together with England’s, began the inexorable process of pressuring China to allow foreigners, including missionaries, traders, doctors, and travelers, to move into the interior. Three treaty provisions in particular constituted the core of this inequitable system: “extraterritoriality” (exemption of the foreigners from Chinese law); “most favored nation” privileges (guaranteeing each nation the same rights other foreigners might be able to extract in the future); and the legal basis for imposing what turned out to be a generally low “fixed tariff” on China (which prevented China from protecting native industries that might become threatened by foreign imports). The war and the 1842 treaty that ended it also, as it turned out, left unresolved the fundamental issue that had triggered hostilities in the first place. Apart from stipulating that of the huge indemnity China agreed to pay, one part (six million silver dollars) was compensation for the opium Commissioner Lin had destroyed, the opium trade itself went unmentioned. 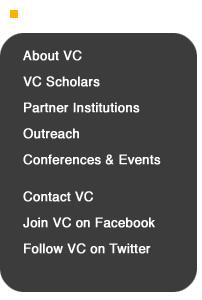 It did not go away. In 1856, fourteen years after the Treaty of Nanking, China and England (together with France) embarked on a second Opium War.